The 30 tooth carbide blade seems to work best on Florida Garage doors. It is the blade that will make the cut all the way through and gives you versatility. What have you found that works and/or challeges when faced against the new garage door codes. 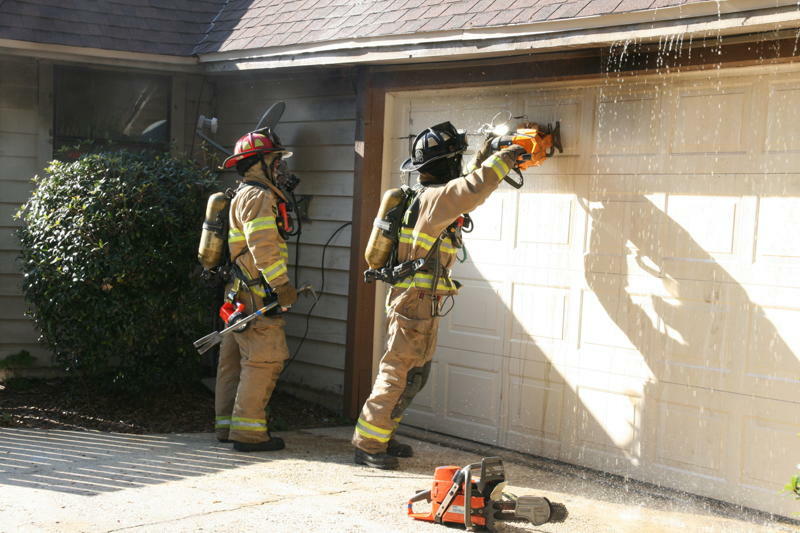 This entry was posted in Irons/OV Position, Truck Company by countyfiretactics. Bookmark the permalink. A technique that we use often is to use the chainsaw and cut around the point where the garage door opener attaches to the door. This is achieved with 3 cuts, one below the attachment, and on each side going to the top of the door. You are then able to open the door, rolling it up and out of the way. Of course this only works if there is a door opener, if not, then you have to slab cut. One benifit of this method is that you only have to replace one panel of the door to fix it ,and you also have a door that can be used to secure the property after we leave. Check out this video on vententersearch.com Click link below. They are challenged by a garage door.